For books, games and all illustration. The Kickstarter campaign is over, but you don’t have to miss out! Don’t worry, you can still grab all the goodies from the Kickstarter page for a short time. If you missed out on the Kickstarter, we unlocked 20 stretch goals, including gorgeous neoprene play mats, a 5th player expansion and a lot more cards to add to the content for the game. I even gave away a campaign mode to say a big thanks to my fantastic backers. Previous Post:Hero Master: An Epic Game of Epic Fails… Succeeds! Jamie is a freelance digital artist from Sussex, UK. He primarily takes on contracts on the literature publishing/self-publishing, and board game projects, but takes on contracts providing illustration and graphic design to many different industries. Among many others, Jamie has provided artwork for League of Legends (Riot Games), Magicka (board game licensed by Paradox Interactive), Ed Greenwood (Forgotten Realms, Dungeons and Dragons) and Richard A Knaak (author of Warcraft, Dragonlance and Diablo series of books). Jamie is always happy to discuss new projects, you can find his contact details, and direct enquiry forms here. 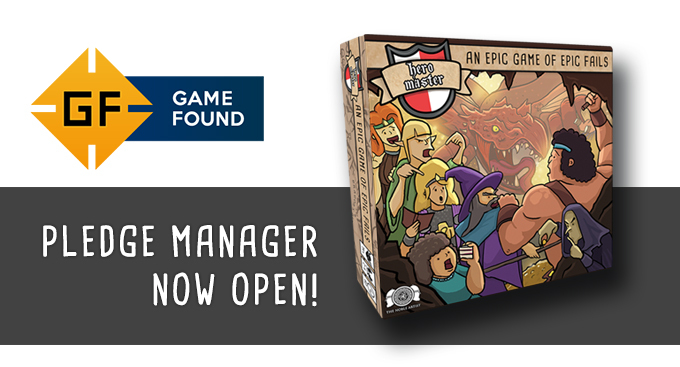 Find out about Hero Master: An Epic Game of Epic Fails!